Landowners in the Northern Division have been urged to make productive and commercial use of their land for their benefits. While speaking to farmers at Dreketi last Tuesday, Minister for Agriculture Inia Seruiratu said Nabalebale youth’s in Savusavu was a shining example of how landowners could reap the benefits of their land. “Today we see thousands of acres of land lying idle bringing benefit to no one,” Mr Seruiratu said. “The majority of the land has excellent potential for large scale agricultural and tourism development. “Landowners can use their land as a collateral for their contribution as a partner in the development of their land,” said he said. He said Fiji imported millions of dollars of agricultural products every year while fertile land lay idle. “Farmers living in Nabalebale in Savusavu and Qelewaqa outside of Labasa Town will soon realise the agricultural potential of their land, once they start supplying fruits and vegetables to the resort,” he said. “This will provide an excellent alternative to sugar cane farming which has become unviable for many struggling farmers. “Let us work together to transform the way we consume, produce, work, and live together without compromising our current or future social, economic or environmental security, without compromising the land on which it all depends. “Let me remind you that every one of us has a role to play. Farmers can invest in smart agriculture that leads to higher yields despite a reduction in inputs. “Policy makers and land managers can support bio-economy by investing in new Sustainable Land Management technologies and processes. “We can all contribute to and benefit from investing in Sustainable Land Management – whether we act as consumers, producers, corporations, or governments,” he said. Mr Seruiratu also encouraged farmers to consider the practice of inter-cropping with mechanisation. “Inter-cropping is the traditional agricultural practice of cultivating two or more crops in the same space at the same time,” he said. “Integrating traditional practices with modern mechanised agriculture is one way of improving yields and reducing the environmental impact associated with agriculture as well reduces labour costs. “There is enormous competition for the use of available land and a dire need to increase the productivity per unit area. Intercropping is one of the ways to increase the land productivity. “The three strategies includes intercropping of short term crops, utilisation of headlands to plant banana, cassava and mangoes and thirdly is the practice of crop-rotation with sugarcane basically rice. Inter-cropping has not only increased the total crop production but helps improve soil health and fertility with no negative effect on sugarcane yield and quantity,” he said. The Ministry of Agriculture is encouraging more farmers to participate in planting yams and meeting the increasing demand in the market. This follows after the European market and neighbouring countries have showed interest in our yams. The price of yams in the overseas market is $1000 per tonne. Provincial Administrator Semi Kuru said the Ministry would be working very closely with the farmers in terms of providing support to the farmers. “We have an Agriculture Extension Services Programme where we are buy planting materials from the farmers and then we distribute it to the other interested farmers especially the varieties that have been proven to be resilient to the changing weather pattern,” Mr Kuru said. “For the Northern Division, Macuata is the main producing area for yam, but we are trying to revive and encourage more farmers to take up this crop especially for the export market. “The purpose of the different programmes was also to create awareness for the farmers to plant this crop and also to promote food and income security. 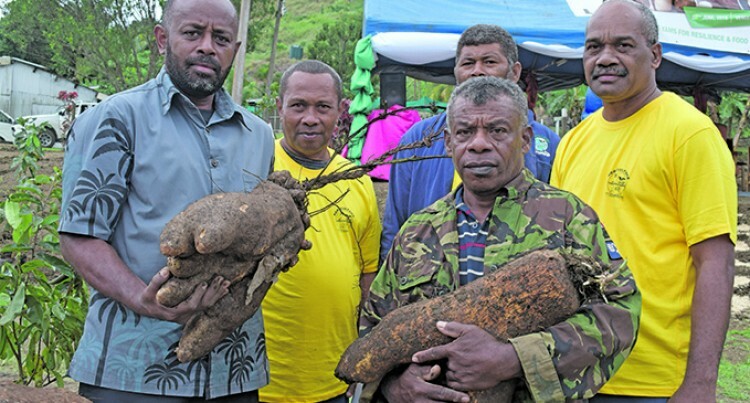 “The Ministry have been organising shows and workshops to promote and strengthen yam production to meet the increasing demands of quality yams for local and export market and to address the revitalisation of the indigenous disaster resilient crops in Fiji,” he said. He said yam planting has been a tradition passed on through generations since the early Fijians settled in Fiji.